This week was the launch of my latest pattern at Pattern and Cloth. The Little Havana dress in sizes 3-12yrs. It's the perfect little dress for this coming summer & its super easy to whip up in an afternoon (or two). I've made a few for my girls to wear for school. They love the over sized pockets & it looks great in cotton, knit or a light linen fabric. Anyone who knows me well can tell you I love fabric, my hoards of fabric well & truly back me up on this point. When starting Pattern and Cloth, the sewing pattern part was always only half of the equation & I very much wanted fabric to play a big role going forward. After all, what is a great sewing pattern without its perfect fabric partner? I'm therefore launching a blog series which will delve into the lives of fabric designers to find out where they've come from, what inspires them & what they're working on at the moment. With the release of each new Pattern & Cloth sewing pattern we'll be interviewing some great fabric designers from across the globe to help you create a sustainable handmade wardrobe for the child in your life, that you & they will love. 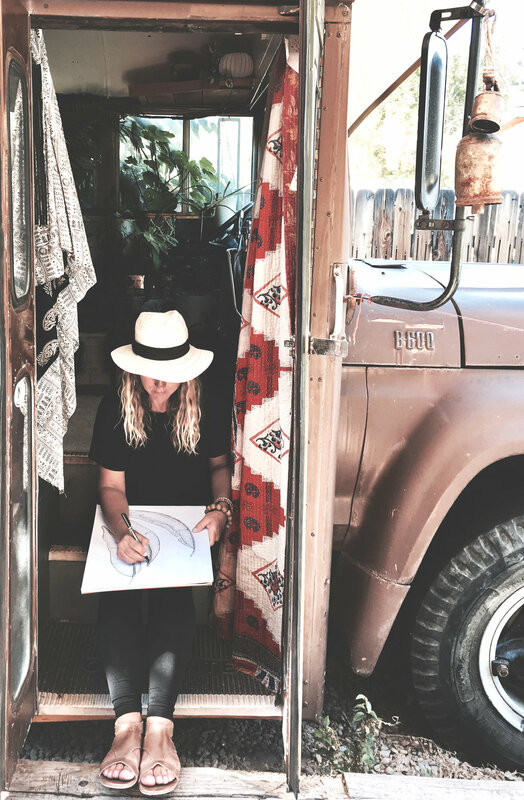 I'm excited to announce our first interview is with pattern enthusiast & visual artist Holli Zollinger from Utah.